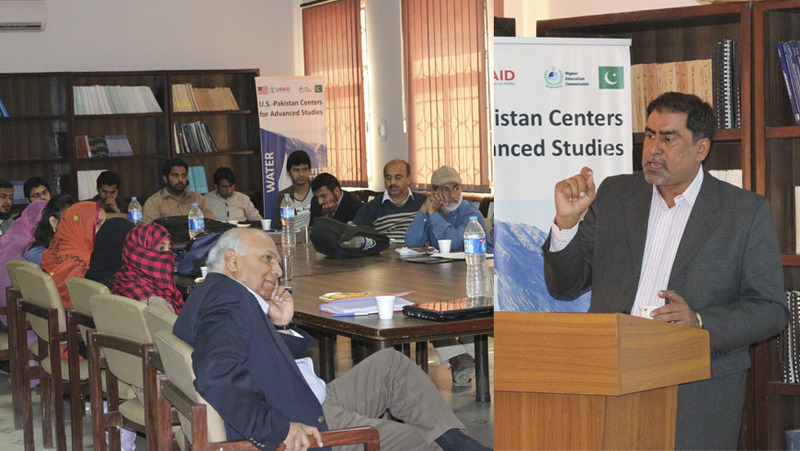 Mr. Nazeer Ahmed Essani, General Manager (Transition) Sindh Irrigation Drainage Authority (SIDA) delivered his lecture in Graduate Seminar on “Water Governance and Institutional Reforms in Water Sector”. 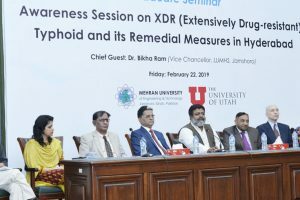 He said fair distribution of water can be materialized by institutional reforms in water sector of Pakistan while SIDA is doing its best by bringing such reforms at grass root level in the designated districts of Sindh Province. Mr. Essain said that country’s irrigation system is one of the best systems developed in British Colonial era, but it was poorly managed in our governance structure. He further said that country is going to face extreme water scarcity and water reservoirs are needed to save the water. In this connection, small dams can be constructed on hilly areas to store rainfall water and the same can be regulated for irrigation purpose in an organized spate irrigation system, he added. He shared the illustrated survey and study report which reveals that how prosperity is linked with water. 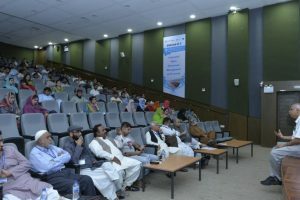 He has presented detail illustrated reports of water mechanism of country and suggested various areas of water research to the students of USPCAS-W. Mr. Essani also quoted the examples of political interference in water governance which deteriorated the institutional reforms in water sector. He was of the strong view that fair distribution of water will only be possible with institutional reforms in water sector. On this occasion, Project Director USPCAS-W Prof. Dr. Bakhshal Khan Lashari presented vote of thanks to the participants and guests. The large number of USPCAS-W students participated in the seminar which was followed by question and answer session. 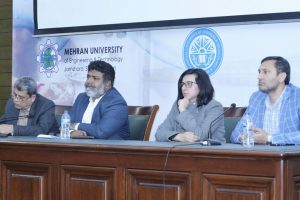 Dr. M.Aslam Chaudhary, Chief of Party/ Deputy Director USPCAS-W, University of Utah, Dr. Sajjad Ahmed, Technical Advisor USPCAS-W University of Nevada, USA, Dr. Kamran Ansari– Deputy Project Director USPCAS-W, Dr. Rafiq Chandio Director Administration MUET Jamshoro, faculty members of USPCAS-W also attended the graduate seminar.